Sprint, leap, and slide as you attempt to escape the Orwellian government that oppresses the world of Mirror’s Edge. As the acrobatic and overly-tattooed Faith Connors, you’ll have to traverse a bleached white city and its seedy underground using your borderline superhuman parkour abilities if you’re to safely escape from the armed feds who’ve made it their duty to end you. Agent Johnson had no idea that this night would be the last that he'd spend with unbroken shins. 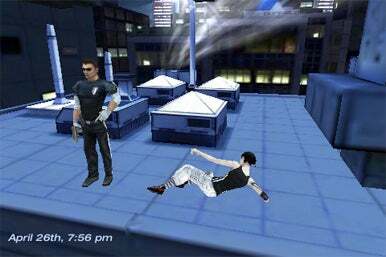 Although the original, console exclusive Mirror’s Edge took place from a strictly first-person viewpoint, this Electronic Arts' portable edition is more of a 2D side-scroller, although the environments and characters are all rendered in beautiful 3D. If you’ve already played the iPad version — which launched alongside the device this April — you’ll find that this tinier port is more or less the same, although the game supports the retina display in all its crisp, I-can’t-believe-these-are-pixels glory. The only other addition to this port are online leaderboards, so you can feel bad about the fact that so many people are better at this game than you. Whenever a console game or franchise is ported to the button-starved system that is the iPhone, controls are always a concern for developers and consumers alike. Freerunning fanatics shouldn’t fret, however, because EA somehow managed to successfully allow players to pull off all the acrobatic moves that make Mirror’s Edge what it is, while at the same time remaining minimalistic enough to work seamlessly on the iPhone. Swiping left or right will make Faith run in the given direction, and as you run you’ll have to use combinations of upward and downward flicks of the finger to leap over and slide under obstacles. Other well timed taps and swipes allow you to run on walls, disarm trigger-happy baddies, and grind down conveniently placed ziplines. The game rarely brings in accelerometer-based control, but when it does it’s usually something gimmicky yet fun, like speeding up Faith’s slides down slanted rooftops. Although a speed run mode and decent extras (like hidden bags within levels) and unlockable wallpapers provide something aside from the main campaign to occupy players, repetitive level design and a bland final boss fight pull down what is otherwise an incredible experience. Despite the fact that there are only 14 levels in the game, you’ll often feel that you’re jumping over the same gap or sliding under the same pipe you've already seen. This is really only a problem in a few of the underground levels, but it’s a niggling issue that could’ve been fixed. Mirror’s Edge isn’t perfect, but it’s an undeniably unique experience that far outpaces other major publisher’s attempts to bring their console franchises to the App Store. Whether you’re a fan of the console game hungry for more digital parkour or you’re just an iPhone owner with an itching for a solid platformer, this is an easy recommendation.